Daryl Impey (born 6 December 1984) is a South African professional road cyclist riding for UCI ProTeam Orica–BikeExchange. Impey is an all-rounder, acting as a domestique for puncheur Simon Gerrans, and as a lead-out man for pure sprinters, in his own right, he generally comes to the fore on tough uphill sprints. His best win to date has been the 2009 Tour of Turkey, despite a controversial incident where he was pushed into the barriers by Theo Bos. After riding for the South African team Barloworld in 2008 and 2009, in 2010 Impey joined Team RadioShack. Impey had originally signed for 2011 with the Australian team called Pegasus, but was forced to seek employment elsewhere after that team failed to secure a UCI license. After riding for MTN–Qhubeka and Team NetApp in 2011, Impey joined GreenEDGE for the squad's inaugural season in 2012. He won a stage of the Tour of the Basque Country in April of that year, before making his Grand Tour debut at the Giro d'Italia in May. In 2013, he became the first South African leader of Tour de France. In July 2014 Impey announced that he had tested positive for the banned substance Probenecid at the South African road championships in February, though he denied any wrongdoing. Impey was subsequently cleared of the doping charges at a hearing in August 2014, which accepted his explanation that the Probenecid had entered his system after ingesting contaminated gel capsules he had bought at a pharmacist. Upon his return, he won the Tour of Alberta by a single second thanks to his victory in the last stage, which gave him enough bonus seconds to overtake Tom Dumoulin. Impey confirmed his good form a couple of days later by taking the fourth place on the Grand Prix Cycliste de Québec. In 2015, Impey had to abandon the Tour de France after being involved in a massive crash on the third stage. He was named in the start list for the 2015 Vuelta a España. 1 2 "GreenEdge adds Impey, Meier". Cycling News. Future Publishing Limited. 11 October 2011. Retrieved 1 January 2012. ↑ "Orica-GreenEDGE (OGE) - AUS". UCI World Tour. Union Cycliste Internationale. Retrieved 3 January 2014. ↑ "ORICA GreenEDGE Cycling Australia : News : In His Own Words: Daryl Impey on Tour of Oman Stage 4". Orica GreenEdge Cycling Australia. ↑ "CyclingQuotes.com Bonus seconds a goal for Impey". cyclingquotes.com. ↑ "UCI bans Theo Bos over Impey crash". road.cc. ↑ "Impey joins Armstrong at RadioShack". Cyclingnews.com. ↑ "Impey and Van Goolen find new teams". Velonation.com. 25 January 2011. ↑ Decaluwe, Brecht (23 April 2012). "Goss spearheads GreenEDGE at Giro". Cycling News. Future Publishing Limited. Retrieved 12 May 2012. ↑ "Daryl Impey: South African cyclist fails drugs test". bbc.co.uk. 2 July 2014. Retrieved 2 July 2014. ↑ "Daryl Impey: South African cleared of doping charges". bbc.co.uk. 29 August 2014. Retrieved 30 August 2014. ↑ Pat Malach (7 September 2014). 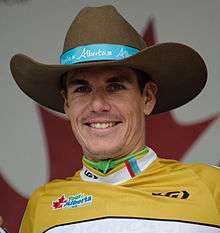 "Impey wins Tour of Alberta". Cyclingnews.com. Future plc. Retrieved 11 September 2014. ↑ "Gerrans wins Grand Prix Cycliste de Québec". Cyclingnews.com. Future plc. 12 September 2014. Retrieved 12 September 2014. ↑ O'Shea, Sadhbh (6 July 2015). "Disastrous day for Orica-GreenEdge at Tour de France". Cyclingnews.com. Immediate Media Company. Retrieved 6 July 2015. ↑ "Ewan wins Vuelta Rioja". cyclingnews.com. 5 April 2015. Retrieved 6 April 2015. ↑ "Tour Down Under: Wippert wins final stage in Adelaide". cyclingnews.com. 25 January 2015. Retrieved 25 January 2015. 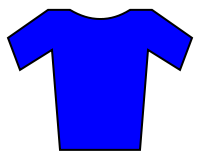 ↑ "Sepulveda wins Sud Ardèche". cyclingnews.com. 28 February 2015. Retrieved 2 March 2015. Wikimedia Commons has media related to Daryl Impey.